It all started some years ago we started getting asked to build yurts that were not as traditional as our standard yurts. We made custom sized yurts, added windows, doors, joined yurts and supplied different linings, covers and insulation. Since that time most of the yurts we make are customised and designed by you, the client. Customisation and the creation of bespoke solutions is now our speciality. We rarely make a standard yurt! Whatever size you want from 9-26 foot diameter we can make for you. Joining yurts is getting more and more popular. 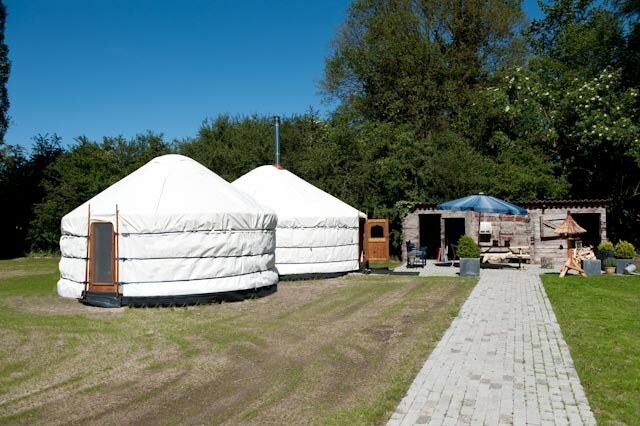 We offer our unique system to join the yurts that allow complete flexibility in allowing the yurts to be separated at any time in the future. The picture on the right shows a 16 and 21-foot yurt joined to provide a sumptuous living space for a couple and their dog. More Photos. Doors are a beautiful and important addition to consider. A real solid wooden door designed for a yurt adds security as well as beauty. The door comes with a security lock and it's tough design means it cannot be broken into easily. More information on Yurt Doors. Windows integrated into the yurt frame, add strength, integrity, light and beauty to your yurt. Our windows are wooden, double glazed and come with shutter and fly screen. Perfect for that view you want to be able to see, for ventilation and most yurts we sell now have a window. In recent years we have been building more elaborate frames that include huge areas of glass, constructed from glass panels made here in our workshop. These Glass Wall Yurts combine the traditional feel of the yurt with the potential for huge amounts of light, fully open to the surroundings.